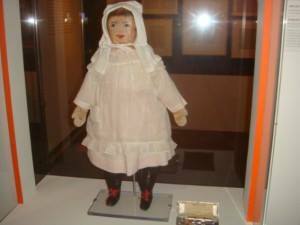 Have you heard of Lilly, the insulin doll? In the early 1920s the Lilly insulin company supplied free insulin to a group of children being cared for by Dr Elliot Joslin. At Christmas time, the children thanked Mr J K Lilly for the gift of the life saving insulin by sending him a personal letter. Mr Lilly was very touched by the letter, and he sent each child a new doll, and a new insulin kit. Each child named their dolls Lilly. 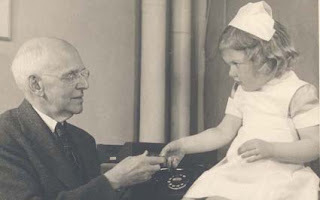 There is a picture below showing Dr Joslin with one of the children. The doll shown was created to celebrate the 77'th anniversary of the discovery of insulin. I could not find a picture of the original doll sent to the children by Mr Lilly. There was also a much more recent attempt to have a "Diabetes Barbie" doll created. One of my Facebook friends was successful in getting that done. You can google "Diabetic Barbie" and see the result of that attempt.